Recently, Elements Massage introduced cupping therapy as a brand-new service. Most people know what cupping looks like (think of those red rings everyone was freaking out about on Michael Phelps’ body during the 2016 Summer Olympics), but they don’t know much else. Let’s break it down. 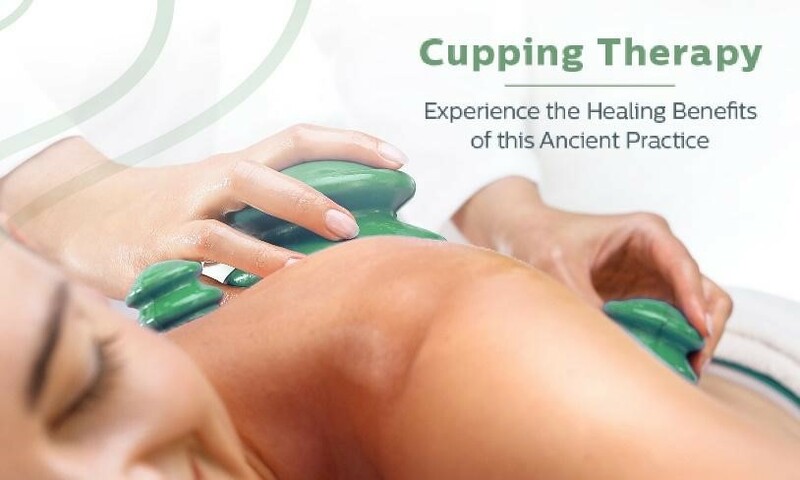 Although it wasn’t popular in the mainstream until recently, cupping therapy is actually an ancient form of medicine that involves a therapist applying suction to certain parts of the body using “cups.” Originating in China, cupping was first performed with cross sections of bamboo or cattle horns. Now, we use silicone. The idea is to produce a vacuum effect that loosens tight muscles and improves blood flow through the body, particularly in the areas to which the cups are applied. Cupping gets fluids that have been stagnant in the body moving, which has numerous benefits. Cupping therapy has been proven to reduce lower back pain, making it a great option to naturally relieve aches and inflammation. That’s why elite athletes use it—to help their bodies heal after strenuous training sessions. Of course, you don’t have to be an Olympic swimmer to reap its pain-relieving benefits. It’s awesome for aches caused by exercise as well as chronic pain conditions alike. Much like massage therapy itself, cupping is a deeply relaxing process. As the blood flow through your body increases, you may notice a warming sensation as your stress melts away. Cupping has incredible effects on the body’s skin. Scars, stretch marks, cellulite and uneven skin tones have all been reported to diminish with the help of regular cupping therapy. As mentioned earlier, the main purpose of cupping is to stimulate circulation. Having a healthy level of circulation is great for cell growth, blood pressure, your immune system and even helps reduce the risk of diabetic health complications. When your muscles are loosened and pliable from cupping, it’s easier for a licensed massage therapist to perform their job. Cupping gets started relieving the tension you carry in your body, and massage therapy does the rest. The first few minutes of a cupping session may be uncomfortable. After all, your skin, muscle and fascia are being pulled upwards all at once. Your massage therapist will check in with you to ensure pressure from the cups stays within your body’s tolerance. After taking a few minutes to get used to it, most people report that cupping feels like a massage. If you’ve ever received a massage, you know that if your licensed massage therapist hits a particularly tense area, you might feel a slight “good” pain, like the kind you feel during a deep tissue massage. Technically, no. Some (but not all!) people have red circles on their skin after cupping, but they’re not actually bruises. Bruising occurs when blood vessels in the skin are injured and break. Cupping doesn’t injure your blood vessels, but it does temporarily expand them. Those large, red circles are simply blood flowing close to the surface of the skin, which is a sign that your circulation is doing well. They don’t hurt either, and they typically vanish entirely between three days and one week. Would Any Conditions Prevent Me from Receiving Cupping Therapy? As always, we recommend consulting with your primary care provider to make sure cupping is safe for you. We look forward to serving our clients with this brand-new healing practice!